Meatball, Garbanzo Bean, and Lentil Soup | Good. Food. Stories. 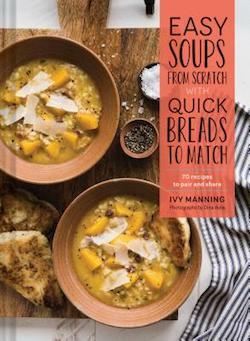 When a copy of my friend and prolific cookbook author Ivy Manning’s latest release—Easy Soups from Scratch with Quick Breads to Match—arrived in the mail, I was justifiably excited. After all, Ivy’s a walking encyclopedia of flavor, coaxing out the most comforting and vibrant combinations from any ingredients she gets her hands on. I couldn’t wait to dive in. But there was a snag: my husband is not a soup guy. As I’ve previously mentioned, he’s into brothy-ish things like stews and sauces that surround ingredients, but is not into drinkable, slurpable hot liquids. What to do? I saw an opportunity: use the book as a gateway to convert Dan into, well, not exactly an adventurous soup lover, but at least a willing and somewhat eager soup eater. With a suggested bread matchup for each of the book’s 45 soup recipes, I knew I’d find flavors and textures that he would embrace. Confident in Ivy’s stellar recipes, I started with what he already liked and worked from there. It was almost too easy…. Not only chili, but pretty much any dish featuring Southwestern flavors always plays well in this house. 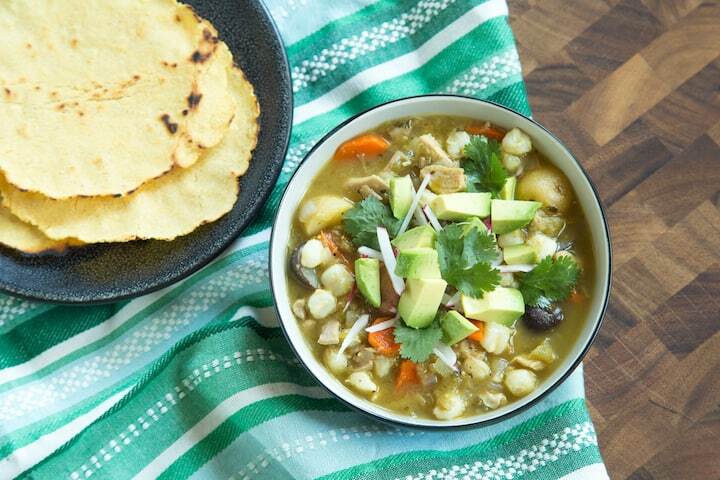 While we usually make a vegetarian chili as our regular recipe, I used Ivy’s pork and hominy stew with roasted Anaheim chiles as a call-back to the food we’ve dug into after long days of hiking in Arizona and Utah. One of Dan’s top ten dishes is cheesy potato gratin, so it wasn’t a stretch to sell him on roasted poblano and potato chowder. Slices of Russet potatoes, slow-simmered with classic aromatics (onion, celery, garlic) until they fall apart into tender bite-size chunks, are thickened by an ingeniously delicious slurry of cream and masa harina. The result is a supremely comforting pot of chowder whose calorie count belies the rich taste. Warm piles of pilot biscuits, like pillowy oversized oyster crackers, were ideal for both crumbling into the chowder or for scooping up the last bits at the bottom of the bowl. 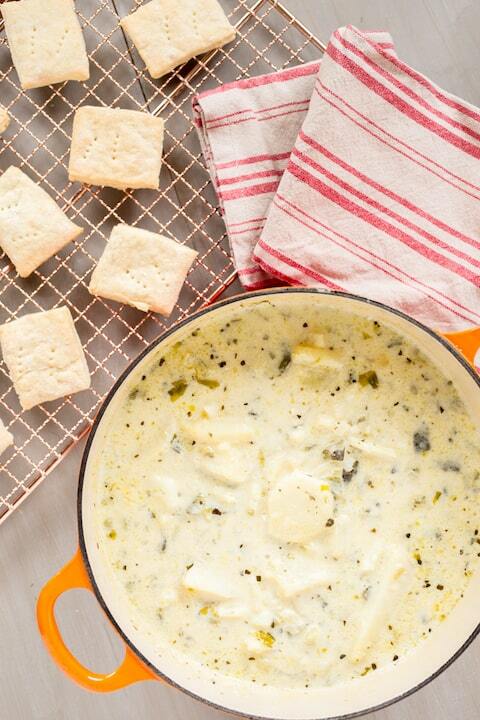 The biscuit recipe makes more than 3 dozen, so you’ll have extra for freezing. He really loves meatballs and pasta. 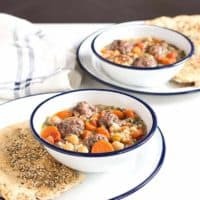 The same technique as I used for my Italian wedding soup pasta worked like a charm with the lamb meatball, garbanzo bean, and lentil tomato soup. I reduced the broth quantity just enough so that the Israeli couscous I chose for the soup—the oversized, chewy-tender version of the semolina spheres we all know and love—would soak it up and turn it into a brothy pasta dish that’s still comfortingly spoonable. This was so deeply filling that it almost didn’t need the coriander- and cumin-topped dukkah flatbread as an accompaniment, but how can either of us say no to bread? Final verdict: soup experiment success! Though I know it will be a cold day in hell before I can convince Dan to try the book’s Korean kimchi and tofu soup or mussel stew with bacon, cider, and cream, I no longer feel like suggesting soup for dinner will be met with an immediate shutdown. After this venture, my confidence that someday we’ll be sharing bowls of Thai coconut chicken soup has increased exponentially. 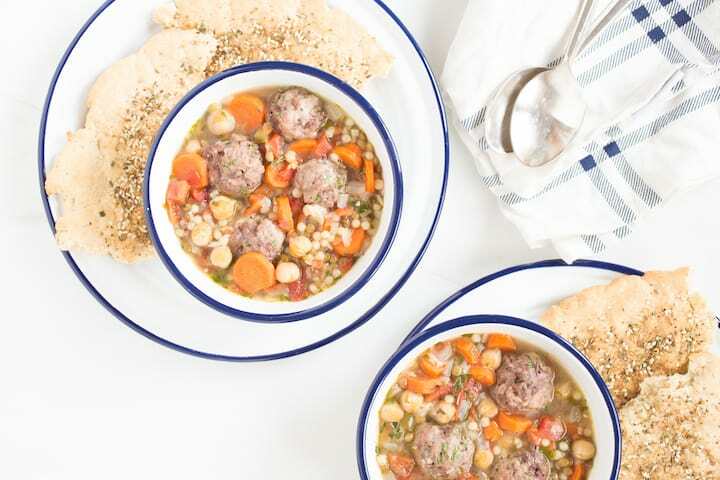 Try this meatball, garbanzo bean, and lentil tomato soup for a filling family meal. Excerpted from Easy Soups from Scratch with Quick Breads to Match, © 2017 by Ivy Manning. Reproduced by permission of Chronicle Books. All rights reserved. Preheat the oven to 425 degrees F. Line a rimmed baking sheet with parchment paper or aluminum foil. In a large bowl, mix the lamb with 1/2 tablespoons of harissa, 3/4 teaspoon salt, and 1/2 teaspoon pepper and blend thoroughly. Bake, stirring once, until the meatballs are no longer pink in the center, about 10 minutes. Drain off and discard the fat. Meanwhile, heat the olive oil in a large soup pot or Dutch oven over medium heat. Add the onion and carrots and sauté, stirring frequently, until the onion is translucent, about 5 minutes. Add the ginger, garlic, cumin, and cinnamon and cook, stirring constantly, until fragrant, about 45 seconds. Add more harissa to taste and stir to combine. Add the chicken broth, garbanzo beans, tomatoes, and lentils to the pot. Cover and bring to a boil over medium-high heat. Reduce the heat to medium-low and simmer, stirring occasionally, until the lentils are almost tender, about 15 minutes. Add the meatballs, dates, couscous, and cilantro and simmer, uncovered, until the couscous is tender and the soup has thickened slightly, about 5 minutes. Add the lemon juice and season with salt and pepper, adding more harissa if desired. 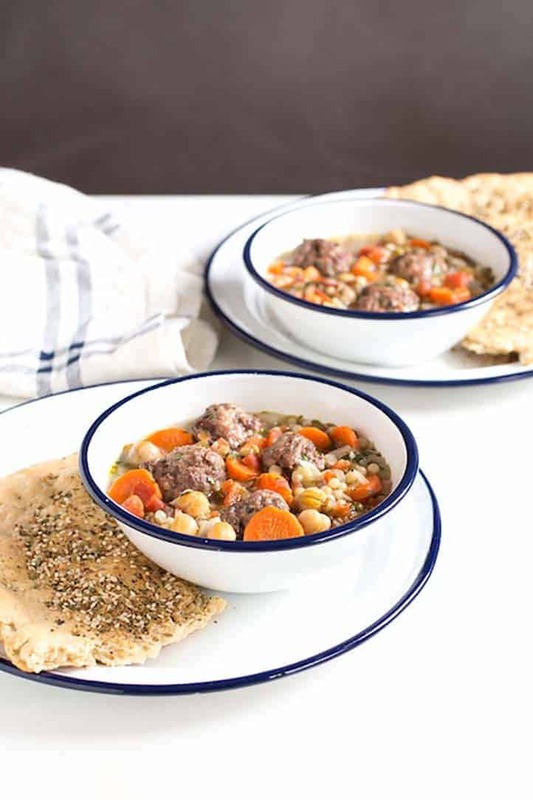 The lamb meatballs can be made and stored in the refrigerator up to 3 days. The entire soup can be stored in airtight containers or zip-top plastic freezer bags in the refrigerator for up to 2 days or in the freezer for up to 3 months. The soup will thicken upon standing; add more broth to the soup when reheating leftovers, if desired.